On the first weekend in November, Amtrak is running a special train called the “Autumn Express” that will travel through southeastern Pennsylvania and northeastern Maryland. Gazing out the windows, passengers will enjoy a dazzling show of fall foliage in rich oranges, yellows, golds and reds. In addition to traveling over the Amtrak-owned Northeast Corridor and Keystone Corridor, the train will make a special trip up the historic Port Road Branch along the Susquehanna River, a rail line that has not had regularly scheduled passenger service since 1978. In addition, on-board narration will describe the landscape and landmarks along the route. Since the early days of railroading, special trains such as the “Autumn Express” have traditionally been commemorated with souvenirs such as buttons, hats and printed programs. 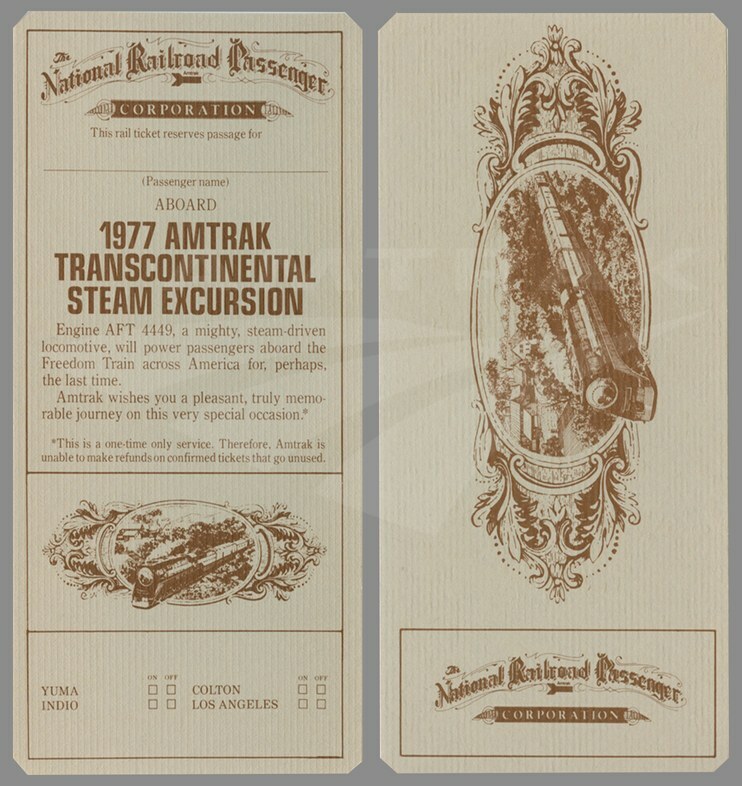 Combing through the Amtrak Archives, we decided to take a look at some of the commemorative tickets issued over the years. 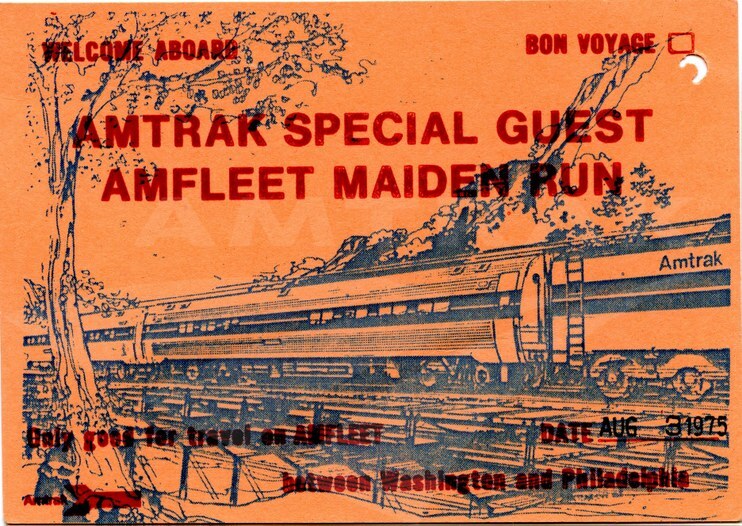 This vibrant orange card was distributed to guests invited for the maiden run of new Amfleet equipment between Washington and Philadelphia on August 3, 1975. It features a blue ink drawing of the tubular cars, with trailing lines indicating movement at high speed. The first of the new single-level Amfleet cars went into revenue service four days later. This ticket not only guaranteed a spot on the train but could also be kept as a memento of this special trip. 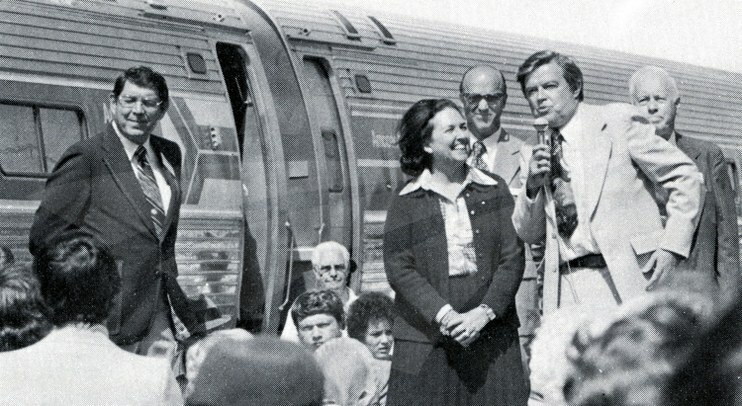 As part of the nation’s bicentennial celebrations, a unique “American Freedom Train” toured the country in 1975 and 1976. Pulled primarily by restored steam locomotives, its display cars contained exhibits with items including a dress worn by Judy Garland in the Wizard of Oz and a piece of moon rock. The train covered all 48 contiguous states and was visited by more than seven million people. One of the borrowed locomotives, ex-Southern Pacific (SP) no. 4449, needed to be returned to Portland, Ore., following the conclusion of the “American Freedom Train” tour in Miami. At the suggestion of the organizers, Amtrak agreed to pull a special revenue train led by no. 4449 from Birmingham, Ala. to Portland. The locomotive had run in revenue service from 1941 until 1957, when it was donated to the city of Portland and placed on static display. In 1974, it was restored for use on the “American Freedom Train” and given a patriotic red, white and blue paint scheme. Today, it is the only surviving example of a SP GS-4 class, streamlined 4-8-4 type steam locomotive and is maintained by the non-profit Friends of SP 4449. The inaugural special of the Pioneer (Seattle-Salt Lake City) ran from June 4-6, 1977, followed by the start of revenue service on the 7th. Members of the press and state and local political and transportation officials rode aboard the train, and at each stop, the general public was invited to tour the new Amfleet equipment. According to an article in Amtrak NEWS, the busiest stops were at Boise, Idaho and Pendleton, Ore.—each had more than 3,000 visitors. In La Grande, Ore., members of the high school wrestling team washed the train with brushes and buckets, and the money earned was spent on a summer camp. Senator Church speaks to the crowd in Shoshone. No stops were made between Portland and Seattle since that part of the route already had regular passenger rail service. The special consisted of two F40PH locomotives, two Amdinettes and four Amcoaches. Initially designated as a two year experimental route, the Pioneer operated until 1997. As Amtrak entered its second decade, it began an international partnership with VIA Rail Canada to operate the Maple Leaf (New York-Toronto), which crosses the border at spectacular Niagara Falls. The train was inaugurated on April 26, 1981. In a unique arrangement that continues today, Amtrak provides the equipment; Amtrak operates the train as it travels up the Hudson River and across New York, but once it clears customs at Niagara Falls, Ontario, VIA employees take over. 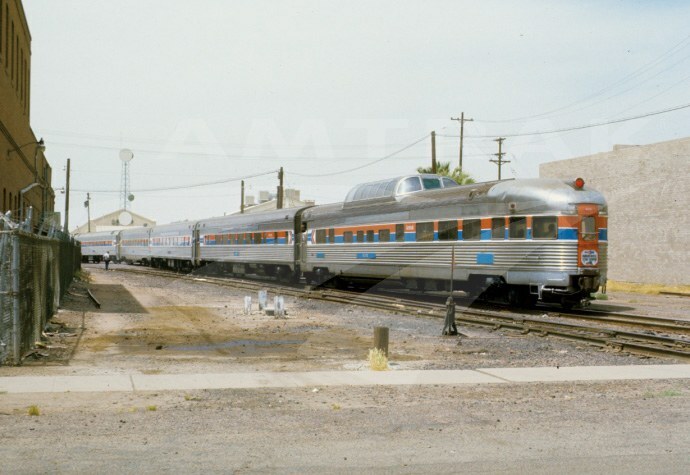 The inaugural train employed single-level Amfleet equipment including Coaches and a Dinette. Prior to the formation of Amtrak and VIA, there were two other Maple Leaf passenger trains, both of which crossed the international border to reach Toronto. The Grand Trunk Western Railroad ran a service from Chicago, while a joint Lehigh Valley/Canadian National service originated in New York. Like many Amtrak trains heading west or north from New York City, the Maple Leaf served Grand Central Terminal until 1991, when the new West Side Connection allowed for the consolidation of Amtrak services at Penn Station. This commemorative ticket is in the red and white color scheme of the Canadian flag and features stars and maple leaves symbolizing the United States and Canada, respectively. By some accounts, the maple leaf has been a symbol of Canada since the early 18th century. The ticket also includes the French “Bon Voyage,” as Canada recognizes both English and French as official languages in all federal institutions. Based on the success of this Amtrak/VIA Rail partnership, the companies joined forces again the next year to launch the International Limited (Chicago-Toronto). It used equipment from both carriers and operated until 2004, when the Amtrak-operated segment was replaced by the Chicago-to-Port Huron Blue Water. The newly branded Amtrak Cascades service debuted in 1998. Funded in partnership with the Washington State Department of Transportation and the Oregon Department of Transportation, three frequencies connecting Seattle and Portland used leased European-style, articulated train sets designed by the Spanish firm Patentes Talgo SA—commonly known as Talgo. New Talgo train sets owned by Washington State were introduced in 1999. 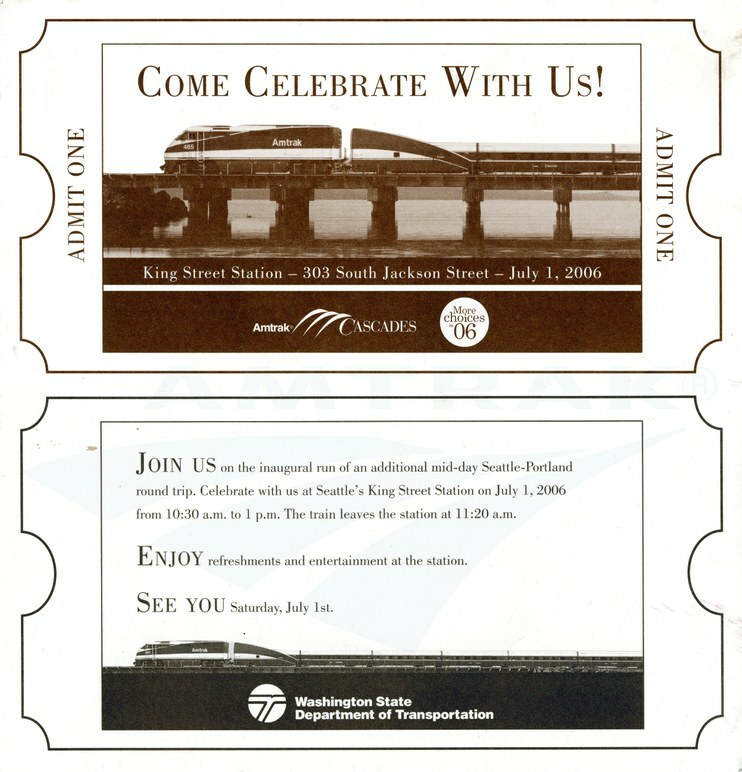 In July 2006, a fourth Seattle-Portland roundtrip was added to the timetable for enhanced mid-day service. Guests were invited to Seattle King Street Station for refreshments and entertainment before boarding the inaugural train for the southbound journey. The Amtrak Cascades brand debuted in 1998. By 2017, Washington and Oregon expect to add two additional roundtrips between Seattle and Portland. To ensure there is sufficient equipment available to support the current Portland-Eugene service, Oregon recently purchased two new Talgo train sets to complement the three owned by Washington and two others belonging to Amtrak. Each Oregon train set will provide seating for up to 275 passengers. Like the other Talgos, these new ones feature advanced technology that allows the train to tilt into curves without having to significantly decrease speed. In all, this tilt technology shortens current travel between Seattle and Portland by 25 minutes. 1“Vintage Steam Train Continues Journey through Spokane,” The Spokesmen-Review, October 20, 2009. 2 National Railroad Passenger Corporation, “Thousands Crowd Stations to See Pioneer Inaugural Run,” Amtrak NEWS, June 15, 1977, 1-5.